Since 1938, KRC members have enjoyed the club's relaxed ambience and many amenities. More than anything, the club is about living a healthy, fulfilling lifestyle and developing friendships for a lifetime. It's a wonderful place to raise a family. 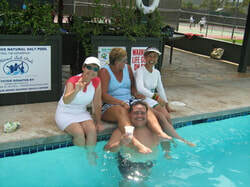 The club has nine courts in tip top condition, a professional coaching staff, salt water pool, friendly staff, and a cafe serving healthy, delicious food. Five courts are lit for night play. From social to ultra competitive levels of tennis, members can get the full experience of learning, playing socially, and competing. Members stay informed of club happenings through the KRC WEEKLY UPDATE, an e-mail newsletter that you may subscribe to by leaving your e-mail address below. If you would like to receive the KRC WEEKLY UPDATE with all the latest happenings at the Kailua Racquet Club, just fill in your e-mail address below and click the button!